Black Aluminum + RGB backlight. With a beautiful black anodized aluminum enclosure, RGB backlighting, and a sleek ultra thin design, we’ve created a PC keyboard that epitomizes style & quality. For White, turn all the way to the left, or all the way to the right — passing through a rainbow of colors in between. It’s the ultimate in simplicity & flexibility. Too much Blue-light exposure at night is known to negatively impact your melatonin levels. This can shift your body’s natural time clock — leading to poor sleep and various other health issues. Dial it back further still, and you get 100% Red — which is the color that least impacts sleep patterns. 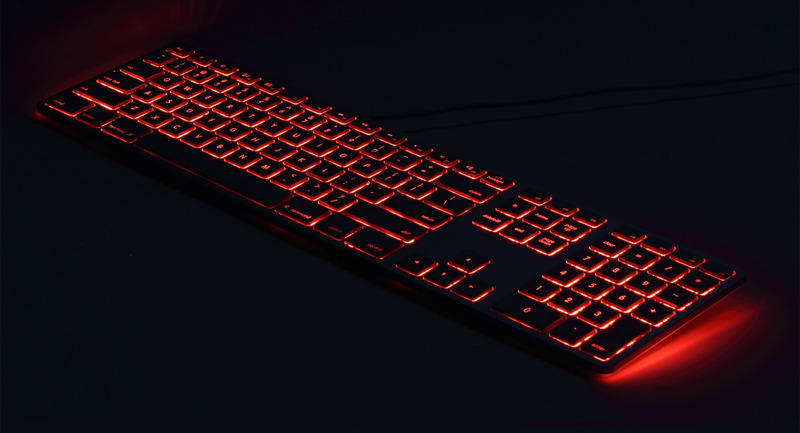 Hold down the fn key, then press + or – to increase/decrease the brightness. You can also select a brightness level directly, by holding down the fn key, then pressing a number (1 = 10%, 2 = 20%, etc.). fn key and Esc turn off the backlight. You can also control music you have playing in the background, with fn key shortcuts for Play-Pause, and Next / Previous Tracks.